Few monuments can claim such a central role in Western Civilization as the Parthenon. 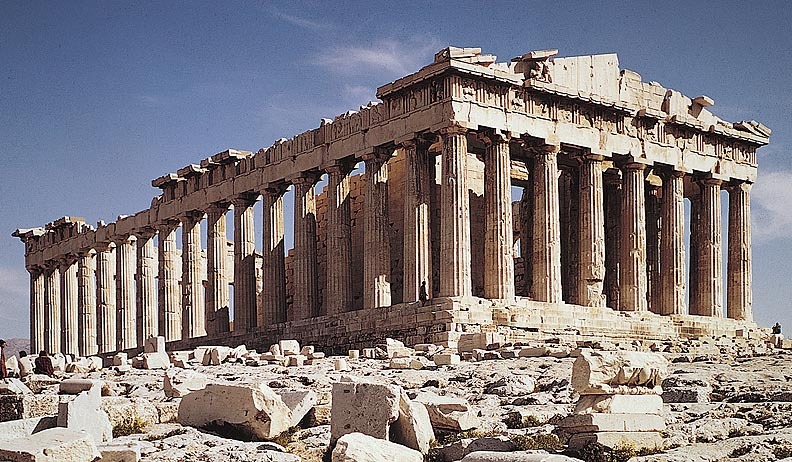 Constructed between 447 and 432 BCE, the Parthenon was created as a symbol of the status of Athens in the Greek world. 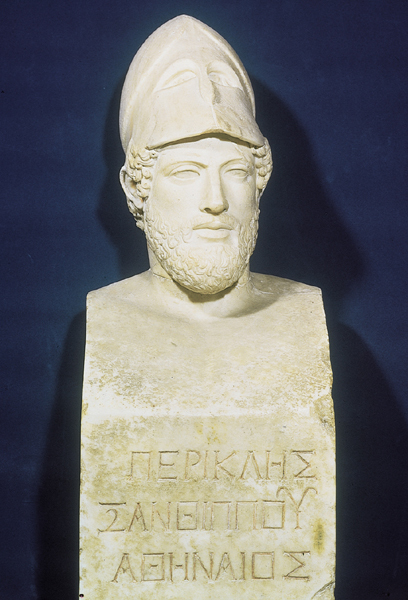 The temple dedicated to Athena was commissioned by Pericles, the major political leader in Athens in the middle of the fifth century. The Parthenon was the capstone of the building campaign initiated by Pericles, and was integral to his cultural agenda of asserting Athenian supremacy in the generation after the great victories of the Greeks over the Persians. As the major temple in Athens, Athenians looked to the Parthenon as a symbol of their identity. Public religious festivals and sacrifices were primary means for defining civic identity in the Greek polis or city-state. I want us to explore the Parthenon and its sculptural program from the perspective of gender. Sculpture had long been integrated into the architecture of Greek temples, but the Parthenon is exceptional in the amount of sculptural decoration and the clear coordination of the different elements into a coherent sculptural program. As a demonstration of the extensive of the sculptural program all 92 metopes in the Doric frieze course have sculptured reliefs [for architectural terms see the glossary at the end of this webpage]. The sculptural program focused around the chryselephantine statue of Athena Parthenos in the naos or primary chamber of the Parthenon. 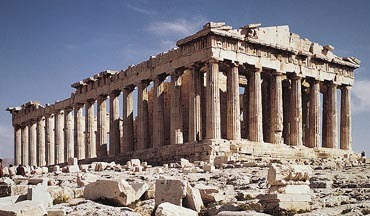 Architecturally, the Parthenon is a mixture of the two major Greek architectural orders, the Doric and Ionic. This mixing of architectural elements undoubtedly signified the central position of Athens in the Greek world. While on the mainland associated with the Doric order, Athens traditionally traced its ancestry back to the Ionians who were largely expelled from the mainland and had settled on the Aegean islands and along the western coast of Asia Minor. 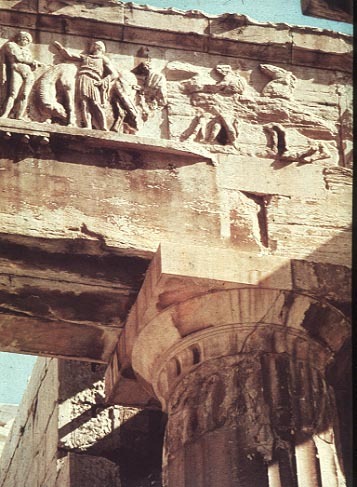 The exterior Doric frieze course contained narrative reliefs in the metopes. 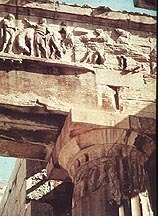 While an interior, Ionic frieze represented the Panathenaic procession. The architectural sculpture culminated in the pedimental sculpture over the east and west ends of the building. Modern Reconstruction of the Athena Parthenos,from the Royal Ontario Museum, Toronto. 'Varvakeion statuette" from Athens, from the 2nd century AD. 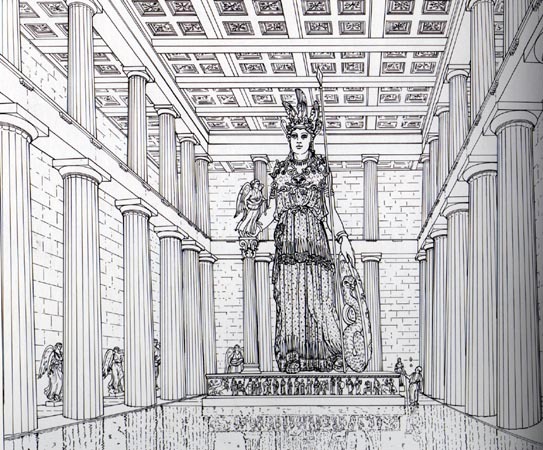 The centerpiece of the sculptural programme of the Parthenon was the monumental statue of Athena in the main cella of the temple. The sculptor Pheidias was commissioned to create the chryselephantine statue made of gold and ivory, and was approximately 38 feet tall (26 cubits tall). Although no longer extant, Ancient copies and literary descriptions have allowed scholars to produce fairly accurate reconstructions. The one above is from the Royal Ontario Museum in Toronto. Consideration of elements that form the statue clearly echo the political meaning of the work. Athena holds in her right hand a Nike figure, or Winged Victory, to commemorate the Greek victory over the Persians. Her helmet bears images of a sphinx in the center and griffins on either side. The eastern origin of these monsters would probably not have been lost on the Athenian observer, who would have made the identification of the monsters to Persia. On the upper-chest of Athena appears an aegis on which appears a gorgoneion (head of Medusa) in the center. The inclusion of these "monsters" plays an apotropaic function of warding off evil, but these figures also echo the Greek subjugation of the monstrous. This is especially true of the gorgoneion. 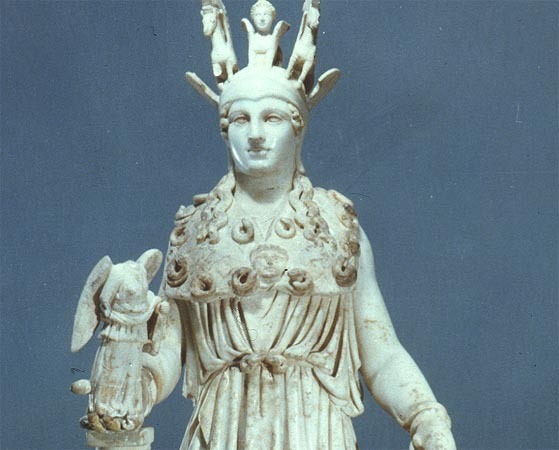 It was Athena who helped Perseus defeat Medusa. Perseus, one of the great Athenian heroes, gave the severed head of Medusa to Athena in thanks. 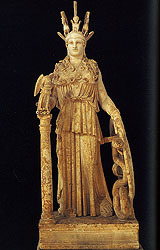 The snake that appears on the inside of Athena's shield is a reference to mythical origins of Athens. The snake was understood as a representation of Erichthonius who was the off-spring of Hephaestus and Ge, or Earth. He was thus understood as a reference back to the aboriginal origins of Athens, and to the time before the Olympian God's triumph over the Giants, the off-spring of Ge. Erichthonius's aboriginal nature is suggested by his snake form. According the myth, Ge entrusted Erichthonius in the care of Athena. The serpent was contained in a box, and Athena, in turn, gave the box to the three daughters of Cecrops with the explicit instructions that the box should not be opened. The daughters did not obey, and when they saw the monstrous shape, they were driven crazy and jumped off the Acropolis. The inclusion of the snake had rich meaning for the Athenians. On one level, that Ericthonius was the off-spring of Ge, was a demonstration of the autocthonous nature of the original Athenians as being original inhabitants of the land. To be an Athenian one had to have parents that both come from families that were Athenian citizens. So an Athenian citizen would see himself [sic since only males could be citizens] as an off-spring of Erichthonius. 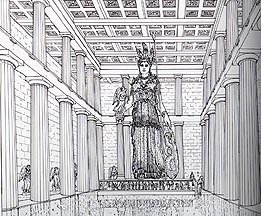 That Athena was given responsibility of looking after Erichthonius who was placed in a box was understood as part of the succession myth where the Olympian Gods overcome the off-spring of Ge and bring them into order. The disobedience of the daughters of Cecrops and their punishments would have been understood as references to the folly of women and the patriarchal structure of Athenian society. The Centauromachy, Amazonomachy, and the Gigantomachy were repeated along with the addition of the Battle of Greeks and Trojans (the Iliouspersis) in the metopes on the exterior of the Parthenon. All of these scenes reiterate the common theme of the Greeks overcoming the other. In the case of the Gigantomachy, it is the story of the victory of the Olympian Gods over giants who are the offspring of Ge and Ouranos --earth and sky. This is the subject of Hesiod's Theogony- one of the earliest works from Greek literature. This is the archetype of all the other conflict scenes. They all echo the victory of order (cosmos) over chaos, civilization over barbarism developed in webpage dedicated to Greek and the Other. 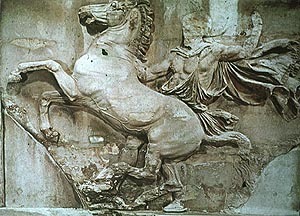 It is striking from a modern perspective to note that though the Parthenon was constructed in clear response to the Greek victories over the Persian, there are no direct representations of these victories on the Parthenon. Though not directly represented, the defeat of the Persians finds echoes in the conflict scenes. For example, the Amazons were female warriors who come from the east like the Persians, and the Troy's location on the boundary between the Greek world and Persia would have clearly been understood to be a parallel to the victory of the Greeks over the Persians. This approach to subject matter reflects a general characteristic of Greek art and reflects what we observed in our discussion of the Greek attitude towards portraiture. Rather than show the particular, the Greek represents the archetype. Contemporary events were read from the perspective of Greek myth and legend. One of the most remarkable features of the sculptural program of the Parthenon is the inclusion of a continuous relief representing a central event in Athenian social and religious life: the Panathenaic Procession. Religious festivals played an important role in defining a community. While solemn religious sacrifices were important, competition in sports, poetry, drama, etc. were a central part of religious festivals. This competitive or what the Greeks understood as agonistic nature of social life we have seen as central theme in the Parthenon. The Panathenaic Festival, or "All Athens Festival," was celebrated every year and in a grander way every four years. 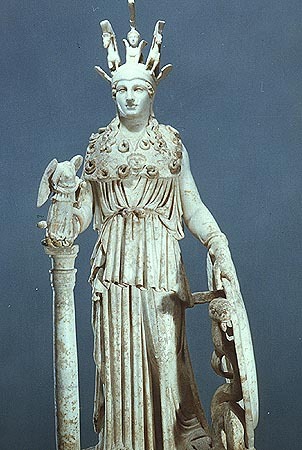 The festival was in celebration of the mythical birth of Athena. The culminating event of the Grand Panathenaic festival celebrated every four year was the Panathenaic Procession. Beginning outside the walls of the city, the procession would wind its way through the city, pass many of the important civic spots, and mount the Acropolis. 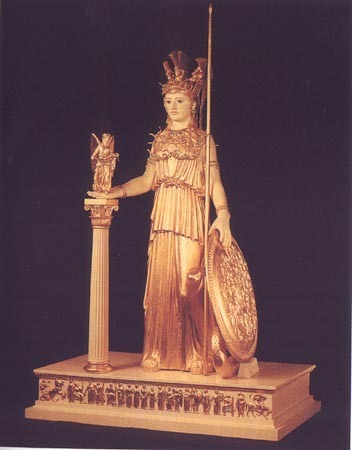 The culminating moment of the procession would be the dressing of the cult statue of Athena (not the Athena Parthenos) with a new peplos or robe decorated with a gigantomachy and woven by a select group of maidens. While there is little question that the frieze represents the Panathenaic Procession, scholars debate about the specific nature. Aspects of the frieze are inconsistent with descriptions of the fifth century celebration. Some have seen this as the first celebration conducted by the mythical founders of Athens, others have associated it with the heroized warriors who had died in the battle of Marathon, and still others have seen it as a generic representation of the recurring procession. As a recurring ritual in the civic life of Athens, the Panathenaic Procession was an important way an Athenian citizen would understand their identity. It is interesting to look at the relief as an image of Athenian citizenship. 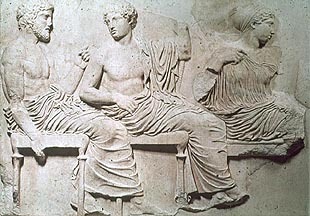 The frieze focuses on the Athenian males. The only women, except for the goddesses on the east end, are the group of maidens. 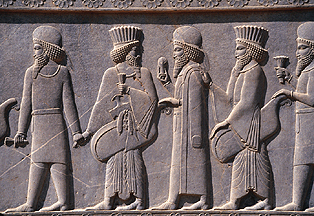 The males included cover a range of age from young men to the elders, all of whom would be considered to be citizens. Although limited to adult males of native parentage, Athenian citizenship granted full and active participation in every decision of the state without regard to wealth or class. The Athenians excluded women, children, resident aliens, and slaves from political life. 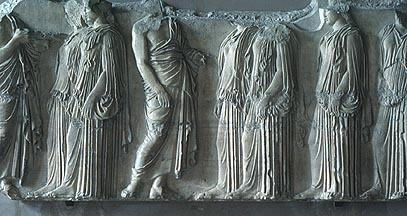 The heavily draped women walk solemnly with down turned heads. They contrast dramatically to the dynamic male figures that dominate the frieze. The women have identified as kanephoroi who were virgins from noble families. 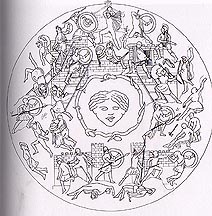 Many of them holding ritual objects suggest that the maidens served as sacrificial attendants. While males included on the frieze cover a range of age from young men to the elders, there are no older women included in the relief. It should be remembered that a citizen of Athens had to have both parents coming from families of Athenian ancestry. Athenian citizens prided themselves as being autochthonous, indigenous people who come from the land. The inclusion of the maidens in the Parthenon frieze would be understood in relationship to the roles these virgins from noble families would play in maintaining the stock of Athenian citizens. The frieze is a striking demonstration of the Athenian artists' mastery of the representation of the human figure. No two figures in the work are identical with the artists capturing the rich variety of human movement. 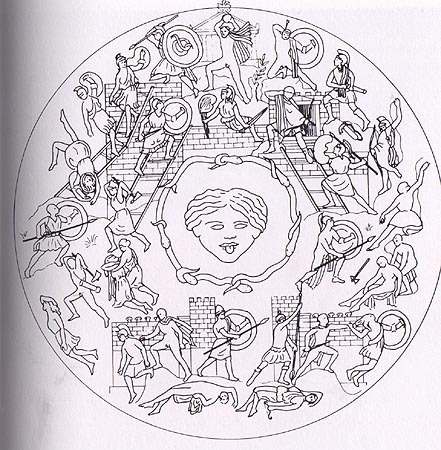 Figures are shown turning in space and from a variety of points of view. 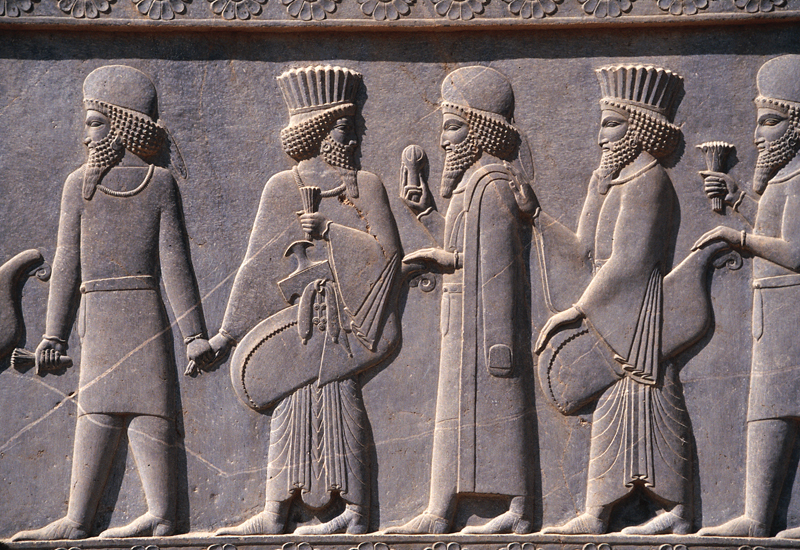 An interesting comparison can be made by juxtaposing a detail from the Panathenaic Procession from the nearly contemporary procession decorating the Persian citadel in Persepolis (c. 521-465 BCE). 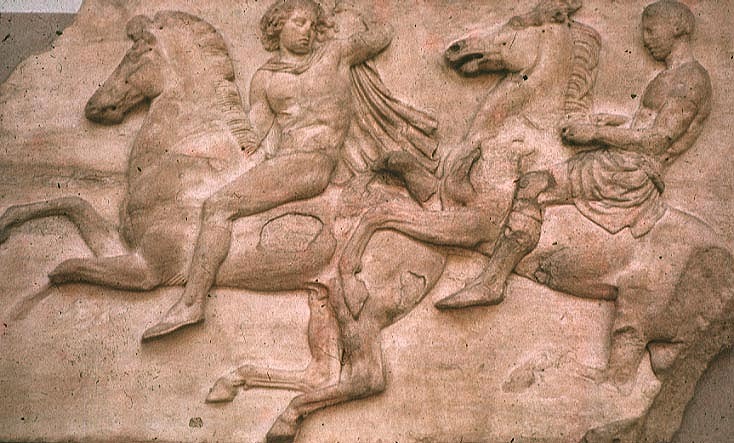 While no two figures are identical on the Parthenon frieze, it is again striking to note the absence of any sense of individual identity in the figures. The artists again focus on types for example the youthful beardless male as opposed to the bearded elder. The procession thus represents all Athenian citizens and not particular ones. The frieze just like the procession itself thus establishes Athenian civic identity. Wonders are many, and none is more wonderful than man. This power spans the sea, even when it surges white before the gales of the south-wind, and makes a path under swells that threaten to engulf him. Earth, too, the eldest of the gods, the immortal, the unwearied,  he wears away to his own ends, turning the soil with the offspring of horses as the plows weave to and fro year after year. The light-hearted tribe of birds  and the clans of wild beasts and the sea-brood of the deep he snares in the meshes of his twisted nets, and he leads them captive, very-skilled man. He masters by his arts  the beast who dwells in the wilds and roams the hills. He tames the shaggy-maned horse, putting the yoke upon its neck, and tames the tireless mountain bull. Speech and thought fast as the  wind and the moods that give order to a city he has taught himself, and how to flee the arrows of the inhospitable frost under clear skies and the arrows of the storming rain. He has resource for everything. Lacking resource in nothing he strides towards what must come. From Death alone he shall procure no escape, but from baffling diseases he has devised flights. Possessing resourceful skill, a subtlety beyond expectation he moves now to evil, now to good. When he honors the laws of the land and the justice of the gods to which he is bound by oath,  his city prospers. But banned from his city is he who, thanks to his rashness, couples with disgrace. Never may he share my home,  never think my thoughts, who does these things! The subject matter of the east pediment is the birth of Athena when Hephaestus strikes the head of Zeus and out of his head comes Athena fully formed. The subject is appropriate since it corresponds to the culmination of the Panathenaic Procession which occurred on the birthday of Athena. Note how the donation of the peplos at the center of the east side of the procession is surrounded by a group of gods and goddesses echoes the gods and goddesses flanking the birth of Athena on the east pediment. The east end is also given more privilege by the appearance of the battle of the Gods and Giants in the metopes. The west pediment presents another conflict or agonistic scene with Athena combatting Poseidon for the patronage of Athens. Both pediments emphasize the superiority of Athena, and thus by implication the superiority of Athens among the other Greek city-states.